Halloween is in less than a week, and if you are like me and every other college student you are probably two things: a professional procastinator and broke. These are serious problems when it comes to dressing up for Halloween; it is more than what should I wear, but is what should I be? Here are some DIY costume ideas that are fun and cheap that are a bit more original than the ghostly white sheet with holes. The Stick Figure: This one is so simple, it is almost cheating. Take white pants and a white shirt, put some electrical tape or other black tape on it for you body. Take a paper plate, draw a face on it, punch some holes for eyes and bam, you have a stick figure costume. 2. Twister Game: Left hand, yellow, right foot, blue. Oh glorious Twister. Embrace the game in a new way by making it your costume. Buy the game, and cut a hole in the mat so that your head can go through, and you can wear it like a poncho. Put a string on the spinner and wear it around your neck. Ta-dum! You are Twister! 3. Magnificent Medusa: Here is a pretty one for you girls. Wear your Greecian inspired dress with some pretty gold jewelry. Put your hair up in a bun with braids and add fake, plastic snakes to your hair. Voila! Medusa. You can find the snakes at Dollar Tree or Walmart for cheap! 6. 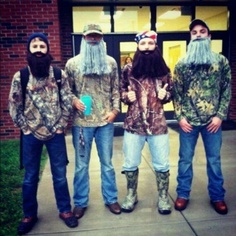 Duck Dynasty: of course you can always put your camo on and start No Shave November early by growing a beard, mimicking Duck Dynasty. If you don’t have their beard growing abilities, though, just go get you one. 7. Making Do: Don’t be afraid to look in your closet. Be a nerd and hike your pants up high with tacky socks. Wear your prom dress and add a tiara to be a princess. Put on pajamas and have a slumber party. Be creative! The important thing is to have fun. Show us what you come up with by sending photos on Facebook. It doesn’t even have to be one that you made. We just want to see what everyone is. As for me, I need to get working on my costume (I’m going to be a disco ball with every glittery and blinged out thing I own plus some.) … oh, how I procrastinate. Thank you for another great article. The place else could anybody get that type of info in such an ideal method of writing? I’ve a presentation next week, and I’m on the search for such info. Previous Previous post: Announcing our First Annual Pumpkin Carving Contest!